For the BFD user in need of a perfectly integrated set of orchestral skins and metals, though, this is a lot of percussion for the money. Large selection of percussion. Integrates with BFD well. 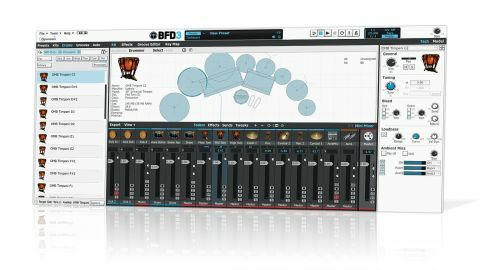 BFD Orchestral is a 9GB library of orchestral percussion for FXpansion's BFD3/2/ Eco. "It all slips effortlessly into the BFD interface, and the instruments themselves sound fantastic"
It covers bass drums (28" with top-mounted cymbals, 40" hard, medium and soft felt beater), snare drums (10"x14" Leedy, 14"x6" stave shell, 14"x5" Rogers Dynasonic), chromatically tuned timpani (26", 29" and 32" Ludwig) and chimes (Musser), two mounted Zildjian cymbals (20" mallet, 18" mallet and stick), and 18" and 20" Zildjian clash cymbals. The kicks and snares are multi-mic'ed, it all slips effortlessly into the BFD interface, and the instruments themselves sound fantastic, with deep multisampling delivering all the requisite nuance and dynamic sensitivity. The only downside is that there are no Kits (or, less importantly, Grooves) included - you have to build your own setups by combining individual elements.